Two new natural gas leaks have been reported at the Aliso Canyon field near Porter Ranch, one of which is still leaking more than a week after first being discovered. But this time it’s not the Southern California Gas Co. storage facility that’s the source, according to the company. Instead, SoCalGas workers found two separate leaks in equipment they say is operated by Denver-based energy company Crimson Resource Management. SoCalGas sent a notification to residents in the Aliso Canyon area saying that on May 24, a SoCalGas field employee discovered a “minor” gas leak from a threaded fitting on a 3-inch line operated by Crimson Resource Management. In a Hazardous Materials Spill Report filed with the Governor’s Office of Emergency Services, SoCalGas said it told Crimson about the leak, which Crimson said it would fix by May 30. However, SoCalGas said in the report that its personnel saw on June 1 that Crimson hadn’t fixed the leak. On that same day, SoCalGas said, its personnel found an open valve on a Crimson oil production line that also was releasing gas into the atmosphere. SoCalGas closed and plugged that valve, stopping the gas release, the company said. The first gas leak from the 3-inch line has not yet been repaired, state regulators said Friday. The state Department of Conservation said Friday that Crimson is working to determine whether the “minor leak,” near Crimson’s oil production operations, is part of the Crimson system. “The minor leak at the Aliso Canyon field has been traced to a pipeline that is not associated with the natural gas storage facility,” said Don Drysdale of the state Department of Conservation Public Affairs Office. A representative at Crimson Resource Management said the company would have more information later Friday. However, multiple calls to Crimson Friday afternoon and evening, both to its Bakersfield office and Denver headquarters, were not returned as of press time. The Aliso Canyon field was the site of a massive gas leak starting in October 2015 that spewed more than 100,000 metric tons of methane into the air, sickening area residents and prompting the temporary relocation of 8,300 households and two schools. 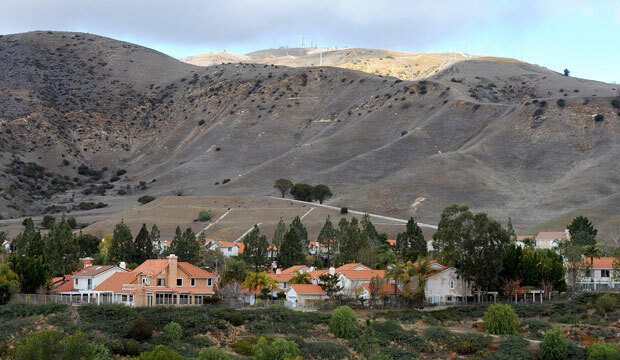 Resident Issam Najm, who is also president of the Porter Ranch Neighborhood Council, said Friday that the most recent leak, reported to residents at midnight by SoCalGas, shows how “callous” the oil producers at the Aliso Canyon field are. Najm said he and other residents have been advocating for the closure of the field altogether. Porter Ranch resident David Young said he was walking his dogs just after 12 a.m. Friday morning when he saw a fire truck at the gates to the Aliso Canyon field as well as two trucks labeled with the word “hazmat” and several other vehicles. Young said he has lived in Porter Ranch for 19 years, and if the facility isn’t needed, he wouldn’t object to its closure. Most recently, area residents have advocated for shutting down the Aliso Canyon field or limiting its use, while SoCalGas and a U.S. Department of Energy official have pushed for returning the storage facility to full capacity. Also, the state Senate recently considered a bill that would block new natural gas injections into the Aliso Canyon storage facility until the cause of the 2015 leak is determined. That bill, introduced by state Sen. Henry Stern, D-Canoga Park, failed to get enough votes earlier this week to pass in the Senate. But it’s expected the bill will be reconsidered in the coming days.